With the non-tender deadline Tuesday night, the Mets made decisions on their seven arbitration eligible players. The team elected to keep all except Eric Young Jr. Young, 29, hit .229 with a .299 OBP and 30 SB in 100 games for the Mets in 2014. The Mets originally got Young in the summer of 2013 in exchange for Collin McHugh, who had a breakout ’14 season for the Houston Astros. With Young getting a raise in arbitration, his speed was a luxury that the Mets couldn’t afford. 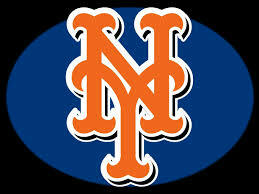 In a surprising move the Mets elected to keep Ruben Tejada who is coming off another tough season. Tejada should get close to $2 million in arbitration so it is surprising that the Mets who are trying to save every dollar they can to find a shortstop elected to keep Tejada at that price range. The Mets also made a mistake in tendering a contract to Bobby Parnell. Parnell is coming off Tommy John surgery and will not be ready for Opening Day. He is also a luxury the Mets can’t afford right now. If they had non-tendered him they could have brought him back at a cheaper salary. Did the Mets make the right decisions at the non-tender deadline? The Mets are in sole possession of third place in the National League East for the first time since after their game at Colorado on May 4. David Wright is hitting .375 (27-72) with a hit in 17 of his last 19 games…He has 15 RBI in that stretch with four home runs. Over Wright’s last 17 starts, the Mets are 12-5. The first half of the 2014 Mets season looks very similar to the 2009-2013 Mets. All of those teams seemed to hang around in the first half until the road trip after the All-Star Break where they tailed of quickly. The Mets haven’t had a winning record in the second half since 2008. Travis d’Arnaud is hitting .295 (18-61) with three home runs and 10 RBI with a .338 on-base percentage in 16 games since returning from Las Vegas (AAA) on June 24. D’Arnaud must improve on his defense most notably balls in the dirt over the course of the second half. He has bounced back nicely. The Mets continue to get on base as Sandy Alderson wants. (Which is what every other GM and coach wants to) The Mets lead the National League and rank fifth in the majors with 335 walks. Curtis Granderson is fourth in the NL with 54 walks. The next 10 game road trip will determine if the Mets sell off pieces according to Sandy Alderson. Unless some player they love falls into their laps (unlikely) the team will not be buyers. Bartolo Colon is really the only player the Mets have that has a decent chance of being traded. How do you feel about the Mets going into the second half? 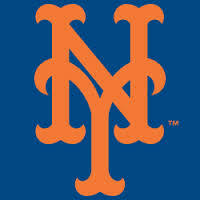 With just 10 days left until Opening Day it is now time to project the Mets 2014 25-man roster. We did this last year and had some success at it so I figure we should try it again. Version 1.0 of this roster projection can be found here. Even though it looks like the Mets didn’t make a lot of changes this offseason, the 25-man roster will look completely different with the exception of the infield. Infielders: This is the only spot that the Mets didn’t change at all this winter with an external player. However the infield could be changed at some point. 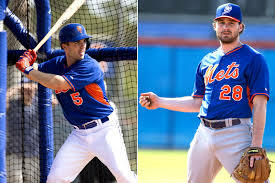 Ike Davis and Lucas Duda will continue to compete for the first base job. The loser will likely be on the bench, barring a trade. 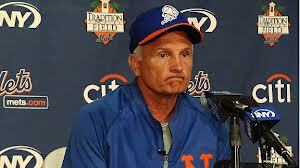 Terry Collins said the job will go to whoever is “healthiest”. That signals how disappointing the two have been and whoever is healthy will likely play against right-handers at first base. 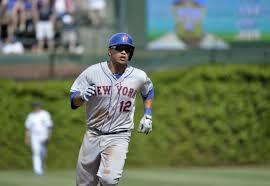 The Mets could still make a move at shortstop but for now, Ruben Tejada will be the starter. Travis d’Arnaud is the only change in the infield. A lot is expected from the young catcher. Outfielders: The Mets are unlikely to carry an outfielder on Opening Day that spent Opening Day 2013 with the team. It is a completely revamped outfield. The Mets spent most of their offseason budget on addressing their outfield. All four outfielders should play a lot. Starting Pitchers: Without Matt Harvey, this starting rotation is still pretty crowded. The Mets 5th starter spot will likely come down to John Lannan and Dice-K. Jenrry Mejia has been getting consideration for a long relief role. The Mets don’t seem to know what to do with Mejia. As of right now I would bet Dice-K is the Mets fifth starter. This is the order the Mets are expected to go the first time through the order. Jon Niese is likely to come off the DL in time to pitch the Mets 5th game on April 6th. That would make Dillon Gee the Mets Opening Day starter. This would also allow the Mets to add an extra bench player through the first couple of games. Bullpen: This bullpen has the potential to be really good with a lot of young guys but also has the potential to be as bad as it was last year. With very little experience we really don’t know what to expect. The bullpen could change a lot between now and Opening Day. Also keep in mind that Carlos Torres is out of options which makes him a lock to make the team. Bench: Other than Anthony Recker the Mets bench will look completely different on Opening Day than it did a year ago. I didn’t believe the Mets were done making moves and are still in the hunt for a middle infielder, whether as a starter over Tejada or as a backup.However with time running out on that, lets assume Tejada is the starter which would likely make Omar Quintanilla his backup. With the Mets first Spring Training game officially underway it is now time to see the Mets top 5 questions for Spring Training. While the Mets look improved, they still have plenty of issues for Terry Collins and company to work out. 1. Who plays first base? Obviously the Mets expected this issue to be solved before Spring Training started. 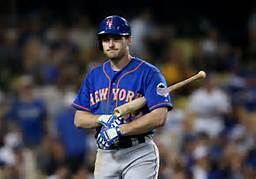 They were deep in talks to deal Ike Davis elsewhere to the point where even he was surprised that he was in Port St. Lucie. He probably has the advantage over Lucas Duda to this point but the first base job is still pretty much wide open. Josh Satin should play every day against lefties anyway at first base. Barring a trade, both players should still be on the Opening Day roster. What does the outfield look like? It appears that all four of Curtis Granderson, Juan Lagares, Chris Young and Eric Young Jr. will play a lot this season. The Mets don’t really have another outfielder that is currently pictured to make the Opening Day roster. I believe Juan Lagares deserves to play every day which would free Young Jr. to be a pinch running weapon off the bench, kind of like what the Reds did with Billy Hamilton last September. This outfield has the potential to be very special. “Runners are going to be very hesitant to take the extra base on us.” Eric Young Jr. told Kevin Burkhardt during the SNY Mets telecast Friday. While Granderson and Chris Young are expected to play every day, Young Jr. and Lagares will compete for a starting job in Spring Training. 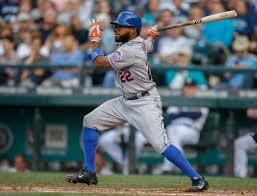 If Eric Young Jr. wins a starting job, then he would play left and Chris Young would move to center. Who is the Mets 5th starter? If Jenrry Mejia is healthy he should be the Mets 5th starter. He has #2 starter upside but with his violent delivery and injury history, there is no reason to think that he can make it through a full season healthy. Dice-K and John Lannan will also compete for the job and the best performance in camp should win the 5th starters job. It is possible that one of these veteran guys end up as a long man in the Mets pen. How does the bullpen shape up? Pretty much everyone in this bullpen is coming to camp with major questions. Bobby Parnell is coming off a major injury, Vic Black, who is expected to be the Mets set-up man, has less than 20 big league innings under his belt. 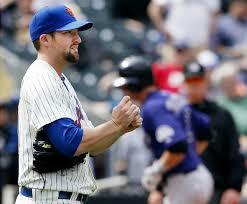 The Mets didn’t bring in anyone on a major league deal to add to the bullpen and winded up losing LaTroy Hawkins. The Mets hope is that Jose Valverde and Kyle Farnsworth can regain some lost velocity and they can be the bridge to Parnell. Young guys like Jeurys Familia, Josh Edgin and Gonzalez Germen will be crucial for this questionable Mets bullpen. What do the Mets do at shortstop? This is the one question that Terry Collins likely doesn’t have control of. Reports of Ruben Tejada still being overweight have continued to pop up throughout camp. Wilmer Flores has lost so much weight that he is now being considered for shortstop reps in spring training. Stephen Drew is still on the market somehow which should continue with no true suitor emerging. His agent Scott Boras speculates that Drew could wait until after the Drew draft so he wouldn’t be tied down to draft pick compensation. Nick Franklin has also come up in Mets trade rumors but the team is unlikely at this point to trade one of their top pitching prospects when they are unsure if he could handle shortstop on an everyday basis defensively. Which Mets question are you most concerned about? Despite not playing any spring training games yet, injuries are starting to pile up for the Mets. In addition to Jon Niese heading back to New York for an MRI, (All the details on that injury can be found here.) Eric Young Jr. and Bartolo Colon have been held out of camp today as a precaution. Young Jr. who may be the Mets lead off hitter, is dealing with a sore side. While Bartolo Colon is dealing with a calf issue. Neither injury has been deemed all that serious. Terry Collins has yet to decide on his starting outfield but we already know that Curtis Granderson and Chris Young will play every day. Eric Young Jr. is the favorite to be an everyday outfielder according to Terry Collins. Collins says unless he changes his approach, Juan Lagares will be a bench player. “As we sit here today, Eric Young is the guy you want to see at the top of the lineup,” Collins said last week. In that scenario Chris Young would play centerfield, Granderson would play right and Eric Young Jr. would play left field. This would be a mistake. 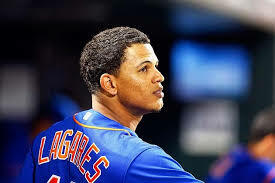 Juan Lagares, is the Mets best centerfielder by far and he should play every day in center even if he hits .240 again. He needs to work on his approach but he should be a better hitter coming into his second season. Lagares can bat 8th as long as he is playing centerfield every day. His defense will make up for his bat over the course of a full season. Eric Young Jr. is best used as a fourth outfielder who can come into the game late and pinch run. The Mets haven’t had any speed on their bench in some time but that could change with EY Jr.
Chris Young has the better arm compared to Grandy so he should play right field. He also probably has slightly better range than Granderson so he should play the bigger right field at CitiField for the Mets. That would put Granderson in left, a position he has played before. If Lagares has a strong spring all of this comes to fruition but he had shown enough last year that he shouldn’t have to win the job this spring.